1 Organisms must do work to stay alive. The energy input necessary for this work is either light, for photosynthesis, or the chemical potential energy of organic molecules. Work includes anabolic reactions, active transport and movement. 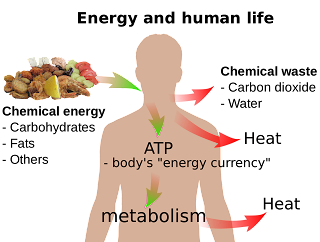 Some organisms, such as mammals and birds, use thermal energy released from metabolic reactions to maintain their body temperature. 2 Reactions that release energy must be harnessed to energy-requiring reactions. Th is ‘harnessing’ involves an intermediary molecule, ATP. Th is can be synthesised from ADP and phosphate using energy, and hydrolysed to ADP and phosphate to release energy. ATP therefore acts as an energy currency in all living organisms. 3 Respiration is the sequence of enzyme-controlled steps by which an organic molecule, usually glucose, is broken down so that its chemical potential energy can be used to make the energy currency, ATP. 4 In aerobic respiration, the sequence involves four main stages: glycolysis, the link reaction, the Krebs cycle and oxidative phosphorylation. 5 In glycolysis, glucose is fi rst phosphorylated and then split into two triose phosphate molecules. Th ese are further oxidised to pyruvate, giving a small yield of ATP and reduced NAD. Glycolysis occurs in the cell cytoplasm. 6 When oxygen is available (aerobic respiration), the pyruvate passes to the matrix of a mitochondrion. There, in the link reaction, pyruvate is decarboxylated and dehydrogenated and the remaining 2C acetyl unit combined with coenzyme A to give acetyl coenzyme A. 7 The acetyl coenzyme A enters the Krebs cycle in the mitochondrial matrix and donates the acetyl unit to oxaloacetate (4C) to make citrate (6C). 8 The Krebs cycle decarboxylates and dehydrogenates citrate to oxaloacetate in a series of small steps. Th e oxaloacetate can then react with another acetyl coenzyme A from the link reaction. 9 Dehydrogenation provides hydrogen atoms, which are accepted by the carriers NAD and FAD. Th ese pass to the inner membrane of the mitochondrial envelope, where they are split into protons and electrons. 10 In the process of oxidative phosphorylation, the electrons are passed along a series of carriers. Some of the energy released in this process is used to move protons from the mitochondrial matrix to the intermembrane space. This sets up a gradient of protons across the inner membrane of the mitochondrial envelope. The protons pass back into the matrix, moving down their concentration gradient through protein channels in the inner membrane. An enzyme, ATP synthase, is associated with each of these channels. ATP synthase uses the electrical potential energy of the proton gradient to phosphorylate ADP to ATP. 11 At the end of the carrier chain, electrons and protons are recombined and reduce oxygen to water. 12 In the absence of oxygen as a hydrogen acceptor (in anaerobic respiration), a small yield of ATP is made by dumping hydrogen into other pathways in the cytoplasm which produce ethanol or lactate. The lactate pathway can be reversed in mammals when oxygen becomes available. The oxygen needed to remove the lactate produced during anaerobic respiration is called the oxygen debt. 13 The energy values of respiratory substrates depend on the number of hydrogen atoms per molecule. Lipids have a higher energy density than carbohydrates or proteins. 14 The respiratory quotient (RQ) is the ratio of the volumes of oxygen absorbed and carbon dioxide given off in respiration. The RQ reveals the nature of the substrate being respired. Carbohydrate has an RQ of 1.0, lipid 0.7 and protein 0.9. 15 Oxygen uptake, and hence RQ, can be measured using a respirometer. 1. 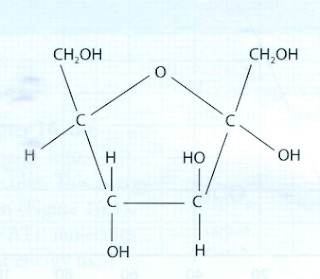 What does not occur in the conversion of glucose to two molecules of pyruvate? 2 Wheredoes each stage of aerobic respiration occur in a eukaryotic cell? 3 The diagram summarises anaerobic respiration. a an energy currency molecule and an energy storage molecule. 6 Copy and complete the table to show how much ATP is used and produced for each molecule of glucose respired in the various stages of respiration. 7 a Explain why the energy value of lipid is more than twice that of carbohydrate. 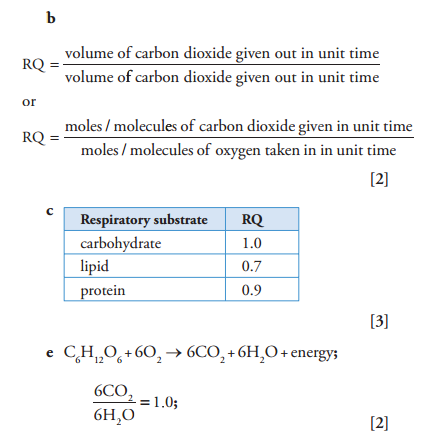 c Copy and complete the table to show that different respiratory substrates have different RQs. d Measurements of oxygen uptake and carbon dioxide production by germinating seeds in a respirometer showed that 25 cm3 of oxygen was used and 17.5 cm3 of carbon dioxide was produced over the same time period. e Dahlia plants store a compound called inulin, which is a polymer of fructose. The structure of fructose is shown in the diagram. thank you your notes are actually very helpful. God bless! thanks!The notes are very helpful but i think the use of diagramatic explanations is very helpful . GOD bless.